#DeadlineDay - The Key Player Moves from Stamford Bridge - Juan Cuadrado & the three year loan. Juan Cuadrado finally got his wish yesterday and despite Antonio Conte telling him that he is a big, big part of his plans, he has re-joined Juventus on loan for THREE YEARS! Why on earth would you want to loan someone for that amount of time? It makes no sense and is beyond me and I simply cannot understand why Chelsea would not decide to sell the player who has made it clear that he doesn't want to be here! 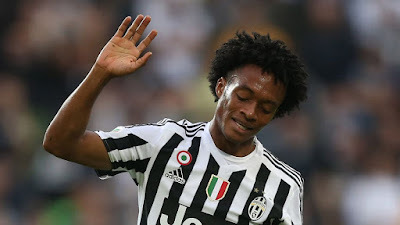 "Juventus Football Club can today confirm that an agreement has been reached with Chelsea for the loan of Juan Guillermo Cuadrado Bello until 30 June 2019, for an annual consideration of €5 million. "Juventus has the right to acquire the player on a permanent basis, or will be obliged to upon the achievement of agreed team results during the loan period, for a fee of €25 million, payable in three financial years, minus the loan fees already paid. "Should Juventus achieve certain sporting results during the player's contract of employment, the club will owe Chelsea an additional €4 million in contingent payments." The story of Cuadrado and Chelsea is (if we are honest) a total nightmare from start to finish and one of the signings that all of us would rather forget and file away with the likes of Slavisa Jokanovic. He never was able to adjust to the pace and power of the Premier League, had little game time to do so as a result and it never really worked out for him. They say that certain people reach a level that is suitable for them and they feel like home playing within and for Cuadrado that's Serie A (as he has proven at Fiorentina and Juventus last season). Despite Conte stating that he wanted the Colombian to remain at Chelsea, I personally could never see him settle down to our League so a move away is the best solution for club and player. However, I am baffled as to why we never pushed Juventus to buy him now considering the monies that made from the sale of Paul Pogba! What do you think of the move for Cuadrado? Do you agree with me that it suits everyone or do you think if given the chance, he would have settled into life in England ?